Looking for a real estate or equipment loan for your business? The SBA 504 loan may be right for you. An SBA 504 loan not only helps small business owners buy commercial real estate and long-term equipment, but it also encourages economic development and promotes job creation. In fact, 504 loans have helped create over 2 million jobs.1 Here’s everything you need to know to help you apply and qualify for an SBA 504 loan. A small business loan can help you when the time comes to invest in new business resources. But with so many small business loan options available, you can quickly get overwhelmed. Fortunately, the U.S. Small Business Administration (SBA) is a great resource for entrepreneurs who are on the market for a loan to start and grow their small businesses. What makes SBA loans so useful? First, the SBA federally backs the loans so they’re less risky to lenders, making it easier for you to get a loan with lower interest rates. Plus, they have different types of SBA loans that all offer low interest rates, low down payments, and long-term financing. That’s a rare treasure worth taking if you can swing it. Note that they do have strict requirements, so you’ll have to wait a long time for funding. However, if you can qualify for an SBA loan, it’s well worth the wait. Of the many SBA programs, the CDC/SBA 504 loan is one of the most popular—mainly because it offers unique benefits to businesses that qualify. SBA 504 loans are all about fueling the economy—they help business owners purchase land or buildings, improve existing facilities, purchase machinery and equipment, or purchase commercial real estate. Plus, they promote job growth in local communities. If you’re looking for a small business loan to purchase commercial real estate or heavy equipment, the CDC/SBA 504 loan may be just the ticket. What is the SBA 504 loan? Think of the SBA 504 loan as a building block for small businesses that support local communities. As the SBA’s flagship loan program, CDC/SBA 504 loans are made available through Certified Development Companies (CDCs)—that is, nonprofit corporations that promote economic development within their communities—and are guaranteed by the SBA. Keep in mind that the 504 loan is specifically designed to promote business growth and create jobs. In fact, a qualifying company is expected to create one job for every $65,000 borrowed. The CDC contributes 40% of the loan, while the bank or lender supplies 50%. The leftover 10% is the borrower’s responsibility. Look for a CDC with a proven track record, excellent support services, and seasoned advisers who can help you sort your finances. When you get an SBA 504 loan, you can expect to save on costs. Unlike other SBA loans, the SBA 504 loan program offers lower up-front fees and fixed interest rates, a huge bonus given the recent trend of rising interest rates. Currently, SBA 504 loan interest rates are 4.66% for a 20-year loan and 4.49% for a 10-year loan. Those are some stellar rates. But your credit score can impact your rate. The higher your score, the lower the rate. SBA 504 loans are amortized (meaning scheduled debt repayments are made in regular installments) over 20 years, with no balloon payment. So you don’t need to worry about a massive final payment. Unfortunately, there’s a prepayment penalty on the 504 loan for the first half of the loan term. In a perfect world, business owners would ask for and receive a loan with the snap of a finger. However, each lender has unique eligibility requirements that must be met before they hand over a big chunk of change. Before applying for any SBA loan, make sure you’re qualified. For a CDC/SBA 504 loan, your business must fill at least 51% of the commercial building you’re financing and meet the local CDC’s job creation and economic growth goals. The requirements don’t end there. You may also need to show a solid business plan and how your expertise in your specific industry will help your business grow. So if you’re a startup, we recommend considering other business loan options. Keep in mind that the SBA 504 application process tends to be more complicated and lengthy because of the multiple parties involved in the deal. Most lenders take a number of factors into consideration when determining if a business owner is eligible. By understanding business loan requirements, you can boost your odds of securing a loan. Good news! With the SBA 504 loan program, you can finance business investments with only 10% down. The rest of the loan will be covered by the bank and CDC. Although both the 7(a) and 504 SBA loan programs benefit small businesses, each differs in their unique purpose. 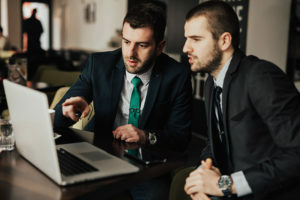 An SBA 7(a) loan has a few more uses and is designed to help businesses establish working capital, refinance debts, purchase equipment, and expand a business. Similar to the 504, the 7(a) loan requires a 10% down payment. The remaining 90% is covered by the bank loan. The maximum loan amount for SBA 7(a) loans is $5 million, whereas the 504 maximum loan amount is a whopping $20 million. If you’re not feeling like the SBA 504 loan is right for you, there are many other SBA loan programs to consider as you decide what’s best for your business. Lendio’s online marketplace matches the borrower with a lender. Wells Fargo is one of the few large banking institutions that still works with small businesses after the 2008 economic crash. The loan powerhouse offers SBA 504 loans from $350,000. When partnering with JPMorgan Chase Bank, you’ll benefit from their lower down payment, favorable fixed-rate financing and pricing, and an unlimited loan amount. Speed is your friend with SmartBiz. Unlike other lenders on our list, SmartBiz funds arrive in as few as 7 days. Lendio isn’t your typical lender. In fact, it doesn’t provide loans at all. Confused why they made our list? Think of them as the Kayak or Expedia of business loans. Lendio’s online marketplace matches the borrower with a lender. Its proprietary algorithm aggregates loan options from networks of business lenders, including traditional banks, to help you find the right option for your business. Although Lendio provides a slew of loan options for small businesses, browse other lenders if you’re looking for fast funding. Unfortunately, SBA loans through Lendio can take up to 30 to 90 days to fund. To help navigate your SBA loan options, we recommend contacting your personal loan manager. Wells Fargo is one of the few large banking institutions that still works with small businesses after the 2008 economic crash. Keep in mind, however, that there’s a surprising amount of customer complaints and negative press against Wells Fargo. When partnering with Wells Fargo, you can seek an SBA 504 loan amount of up to $6.5 million. Its terms are up to 20 years on real estate and up to 10 years on machinery or equipment. Depending on your specific loan, you may be required to pay fixed or variable rates. Don’t forget to consider those pesky hidden fees. Keep in mind that this bank loan will also include an origination fee. For real estate loans, you may have to pay fees for an appraisal, environmental reviews, and filing fees. Joining Wells Fargo and Bank of America, JPMorgan Chase Bank is considered one of the “big four” banks. These “big four” banks hold 39% of all U.S. customer deposits.2 When partnering with JPMorgan Chase Bank, you’ll benefit from their lower down payment, favorable fixed-rate financing and pricing, and an unlimited loan amount. Their standard SBA terms are 10 years for equipment or 20 years for real estate, with up to 30-year amortization. SmartBiz estimates their APR at 7.18% to 10.34% with loan terms from 10 to 25 years. For commercial real estate, SmartBiz offers loans from $500,000 to $5 million. But again, watch out for those pesky fees—and there are several associated with SmartBiz SBA loans. For example, SmartBiz charges a one-time referral fee and a one-time packaging fee for commercial real estate loans. Speed is your friend with SmartBiz. Unlike other lenders on our list, SmartBiz funds arrive in as few as 7 days. Although their streamlined platform is quick and easy, be prepared to submit more documentation than other online small business lenders. Before signing on the dotted line, you’ll likely want to know the amount of your monthly payment. Typically, loan sums are determined by the borrower’s credit score, profit and loss statements, and purpose for the loan. Loan payment amounts are estimated by loan sum, interest rate, term rates, and guarantee fees. To estimate your SBA loan payments, consult a free SBA loan payment calculator. With several different types of SBA 504 lenders available, you’re sure to find a financing option that will help you fund asset purchases, such as land or equipment. Think the SBA 504 loan program may be for you? With affordable interest rates and low down payments, you can ensure your business has the capital it needs to grow and flourish.